The cast and crew of ‘‘La La Land’’ (which had already won six awards during the ceremony) arrived on stage to accept the award. Producers Jordan Horowitz and Marc Platt delivered their speeches, when all of a sudden there was a flurry of activity on stage. A man with a headset started talking to several people on stage, as did Martha Ruiz, only one of two accountants in charge of tabulating Oscar ballots — and therefore only one of two people who knew all the winners before the show. As people were conferring behind him, producer Fred Berger stepped up the microphone. He was in the middle of thanking his family when he briefly turned around. ‘‘We lost, by the way,’’ he said. Jordan Horowitz was just doing his job, accepting an Oscar for the film he produced, when an opportunity for greatness was thrust upon him. As the audience (and millions of viewers) tried to process what happened, the camera panned to the cast of ‘‘Moonlight’’ in the crowd, clearly in shock and hugging each other. Horowitz demurred: ‘‘I’m going to be really proud to hand this to my friends from ‘Moonlight,’’’ he said. ‘‘That’s really nice of you,’’ Kimmel said. 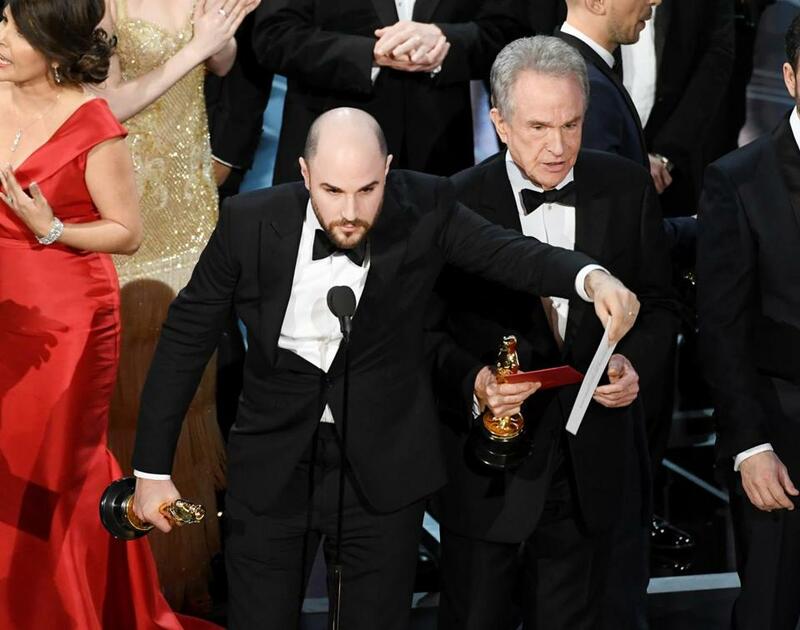 “La La Land” producer Jordan Horowitz held up the card naming the winner for best picture at Sunday’s Academy Awards — “Moonlight.” That was after “La La Land” had been announced as top picture. Beatty stepped forward to try to clear up the confusion. ‘‘Warren, what did you do? !’’ Kimmel yelled. 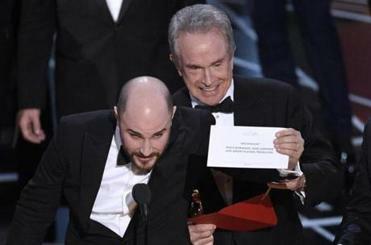 Beatty went on to explain he had paused earlier when he looked at the envelope was because it said ‘‘Emma Stone, ‘La La Land.’’’ Stone had just won best actress. ‘‘That’s why I took such a long look at Faye . . . I wasn’t trying to be funny,’’ Beatty explained to the audience. ‘‘Well, you were funny,’’ Kimmel said. An additional wrinkle was added to the saga backstage, where Stone explained that she was on stage after ‘‘La La Land’’ was announced as winner with her best actress Oscars and card in hand. E! reported that Warren Beatty was handed the wrong envelope, and showed a close-up shot of the envelope labeled as such. Horowitz gave a play-by-play after the ceremony on E!, explaining that he had taken the envelope after the winner was announced and held it the card as he gave his acceptance speech. ‘‘There was a guy, a stagehand guy, who started kind of buzzing around, looking for the envelope,’’ Horowitz said. Meanwhile, also backstage, ‘‘Moonlight’’ director Barry Jenkins said he’s a longtime Oscar viewer, and had never seen anything like this happen before.